The January birth flower is the Carnation. The carnation, also known by the nickname ‘carn,’ has been cultivated for centuries for its ruffled blooms, favoured for its fragrance and hardiness. This Eurasian plant has a spice scent, and is also called the Clove Pink or Gillyflower, and can be found in numerous colours ranging from pink to purple-red and are said the symbolize love, fascination and distinction. As legend has it, pink carnations were said to have appeared below the Virgin Mary’s tears as Jesus carried the cross and as a result, the pink variety symbolizes a mother’s love. 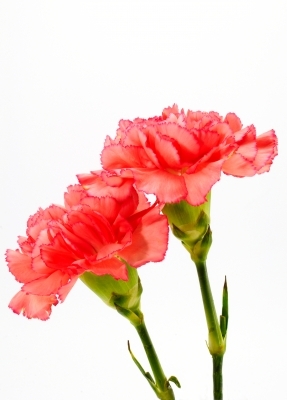 Carnations carried the meanings of love, fascination and distinction. Other meanings attached to carnation colours include passionate love (red), rejection or distain (yellow), innocence and steadfastness (white) and whimsical and capricious (purple). The hidden meanings used in the Victorian Era included “My Heart Aches For You” (red), “I’ll Never Forget You” (pink), “You Have Disappointed Me” (yellow) and “I Wish I Could Be With You” was the very special secret message attached to the striped carnation. Over three hundred species of carnations and hundreds of hybrids exist, as this flower has been cultivated for the past two centuries in Asia and Europe. The red carnation was adopted as the official state flower of Ohio in United States. The choice was in honour of President William McKinley who habitually wore a red carnation in a jacket lapel buttonhole. They are the official flower of Mother’s Day as chosen by the founder of the holiday, Anna Marie Jarvis, to honour her mother Ann Maria Reeves Jarvis who promoted worker health and safety. After her mother’s death, Jarvis campaigned to have Mother’s Day recognized as a holiday and went as far as to send 500 white carnations to her mother’s parish church in 1907 for all the mothers in the congregation. Her wish was granted in 1914 by President Woodrow Wilson. They have also been traditionally given to honour a first wedding anniversary. The carnation is the national flower of Spain where they are called ‘clavel,’ a word closely related to ‘clove’ which describes the fragrance from the flower. As carnations are considered an edible flower, petals are a popular choice for cake decorators and have also been used in the making of the French liquor Chartreuse since the 17th century. They have also been used to decorate ice cubes and to bring flavour to certain types of salads.